Cablguy184's Content - Car Audio Forum - Car Audio's Forum! Yes, It's true. I am leaving Comcast Xfinity. I've worked there for 17 years and just do not see me working there the rest of my life. I will be updating this thread to let everyong know what is next for Cablguy184. Stay tuned !!! Thinking about making a MAJOR career change. Productive weekend. Got some work done. Wish I had more good weekends like this !!! 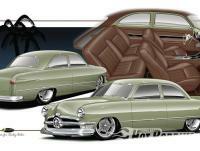 Looks like I have me a new (old) toy to work on ... a 1949 Ford 2 door sedan !!! Going to drag her out of the woods this weekend and snap some pics !!! I know, i'm primarily a Chevy guy, but this one I just can not resist ... These are my dad's favorite body style cars and he has always fixed them up origional ... Not me !!! It has a Flat 6 in it now that runs great, so we plan to leave the drive train stock until we get the body up to par ... Just not sure yet as to go with a Ford or Chevy drive train ... guess it all depands on what I can find to fix her up with at that time ... I can not wait to tear into this thing !!! Stay tuned !!! I'm gonna build me a street machine !!! Thank God it's Friday !! !